commented on "While most of the photographs in my soon to be launched history of the Church Steps - 'Meet You At The Church Steps - A Social History ..."
While most of the photographs in my soon to be launched history of the Church Steps - 'Meet You At The Church Steps - A Social History of a Nelson Landmark' - are from the wonderful Nelson Provincial Museum and the Nelson Mail, some have come from two dedicated Nelson postcard collectors. Ken Wright and Rob Packer both have large collections of Nelson postcards, including a number showing the Church Steps. The photo on my publications page about the book shows Thomas Cawthron standing at the bottom of the new steps on the day of their official opening on 13 September 1913 . It's one of Ken's, as is the one of the old wooden steps shown here, which is one of my favourites. What is great about having access to Ken and Rob's collections is that they have some images the Nelson Provincial Museum does not. I couldn't find any of the day the Cawthron Steps opened but Ken had two. He also came up trumps when I was looking for a photo of the night the steps and Trafalgar Street were lit up when electricity was turned on in the city for the first time. Rob had some brilliant photos too that I hadn't seen before and which appear in the book. So a big thank you to both of you. It's great to be able to share some of the images in your collection in this book. 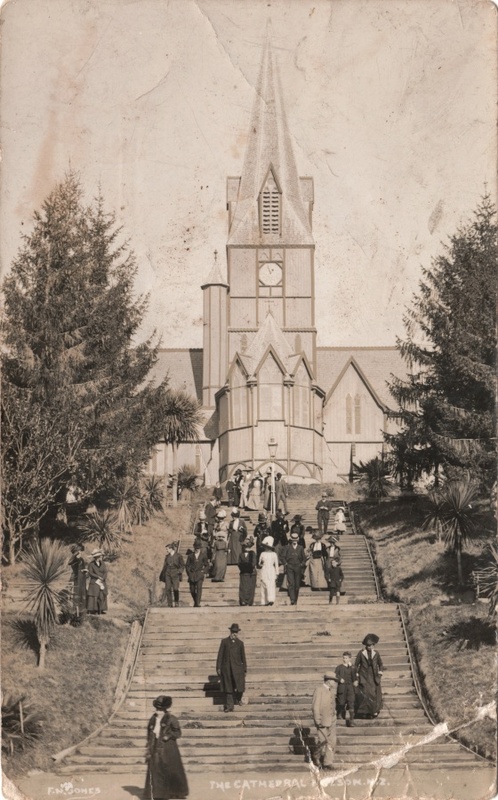 'Meet You At The Church Steps - A Social History of a Nelson Landmark' will be launched on the centennial of the opening of the Cawthron Steps, Friday 20 September 2013.